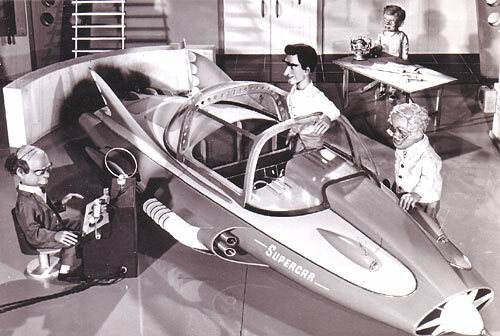 A Publicity Still from AP Films/ATV's 1960 TV series "Supercar." The fourth marionette TV series produced by Gerry Anderson, which came immediately after "Four Feather Falls" and before "Fireball XL5." Each episode of Supercar ran for 25 minutes and in total, 39 episodes were made over two series - 26 episodes in the first series broadcast between 1960 and 1961 and a further 13 episodes in the second series broadcast from 1961 to 1962. Seen here are the principal characters from every show: Mike Mercury, Professor Popkiss, Dr Beaker and Jimmy Gibson.